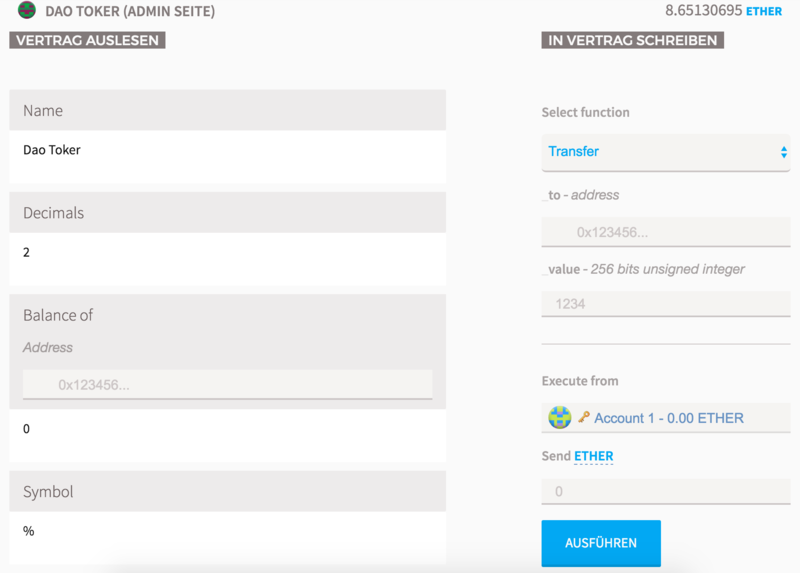 and i have 8.65 ethers used -> i thought this is the right way in order to receive DAO Token. So but the message from this transaction is this: "Transaction could not be executed" not enough Gas. When i click to the contract is there: "The transaction needs more gas to get carried"
But i have a contract with the Ethers in my Contract Tab. When i click into the contract i can choose on the right side a "select function" which is named "transfer" but it doesn't work. What can i do to get my ethers back in my main account? @samsam90 So you created your own MyToken contract and sent it money thinking it would give you 'The DAO' tokens in return? If that's the case, I'm afraid you've greatly misunderstood The DAO. The DAO funding has finished now, but when it was open, simply sending eth to its address would register tokens against the address you sent from. The 'MyToken' contract you've created is simply an example of a tokens contract and a very incomplete one. It has no function to actually withdraw ether that has been sent to it and I'm afraid they are now stuck for good.